The Wisconsin Supreme Court just dealt a death blow to the Fourth Amendment, which is supposed to protect a citizen against unreasonable search and seizure. What’s more, the decision was made by a single, newly-appointed judge who was not even present when arguments were made in court. In a 4-3 decision, the state’s highest court ruled that evidence seized in a person’s private home during a warrantless search can be used against the person under an expanded view of the “community caretaker” clause. Police went to Charles Matalonis’ house after his brother was found bloodied at a nearby residence. Matalonis, admitting he fought with his brother, let the cops in, where they saw blood in the apartment and some cannabis. They wanted to look inside a locked room, and when Matalonis refused to unlock it, the cops broke in. There they found a cannabis growing setup, whereupon Matalonis was arrested and charged with manufacture of cannabis. If the case had remained deadlocked at 3-3, then the Court of Appeals ruling that the evidence should be suppressed would have stood. But in a move that is without precedent in the U.S. or the Wisconsin Supreme Courts, newly-appointed Justice Rebecca Bradley cast the deciding vote without participating in oral arguments. “No precedent appears to exist in the United States Supreme Court or in this court for a new justice who did not participate in oral argument to participate in the case without re-argument,” said Justice Shirley Abrahamson. Bradley was appointed by Governor Scott Walker after Justice Patrick Crooks passed away on Sept. 21, and is now running for election. Bradley had not participated in five earlier cases since her appointment, but decided to chime in on this one. She believed that listening to taped recordings of the arguments, instead of being there in person and involved, was sufficient for her to make the call. So, an unelected judge appointed by a partisan politician cast a single vote, without being present during arguments, which effectively nullified the Fourth Amendment in that state. 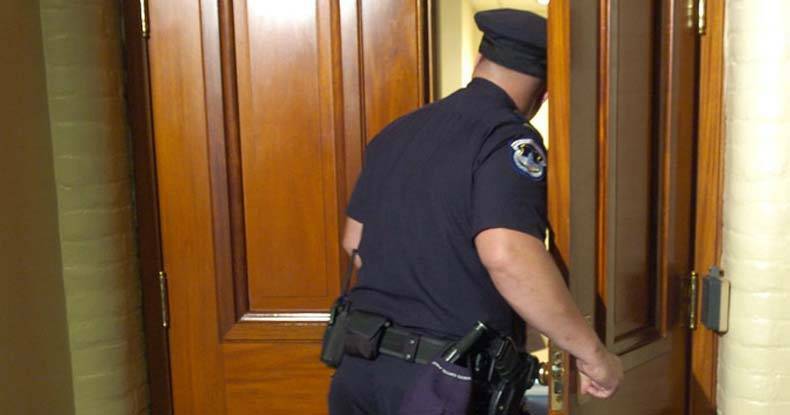 Now in Wisconsin, cops can enter a person’s home without a warrant, seize evidence and use it against the person. The irony is that this attack on the Fourth Amendment is being carried out under the guise of cops being “community caretakers.” In other words, the state presumes that it is doing what’s best for the common good by violating the rights of the individual.